The picture shows a four chamber cell, in which the salt chamber (salt NaX) with the adjacent anion and cation exchange membranes is the heart. 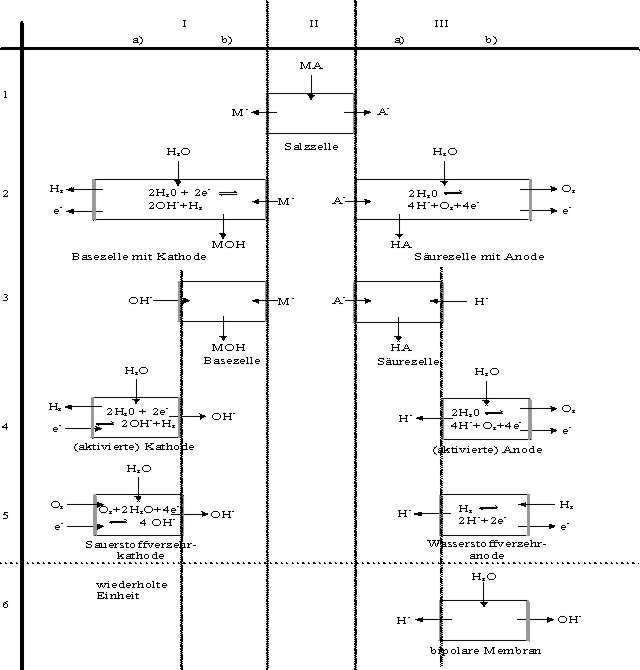 Within this setup, the cations moves toward the cathode entering the catholyte solution: the cation hydroxide is formed. The anions move toward the anode entering the acid solution, which is separated from the anolyte solution by a cation exchange membrane. Through this, protons from the anolyte solutions move into the acid chamber to produce the acid. Fermentation processes producing organic acids such as gluconic-, lactobionic-, lactic- or acetic acid and many others from fermentation broth. Production of mineral acids from salts such as nitric acid from nitrate solutions, hydrochloric acid from chlorides or sulphuric acid from sulphates. The next image shows variations of this setup: In certain cases, the membrane between anolyte and acid is not necessary, in other cases, an separating membrane towards the catholyte is helpful. 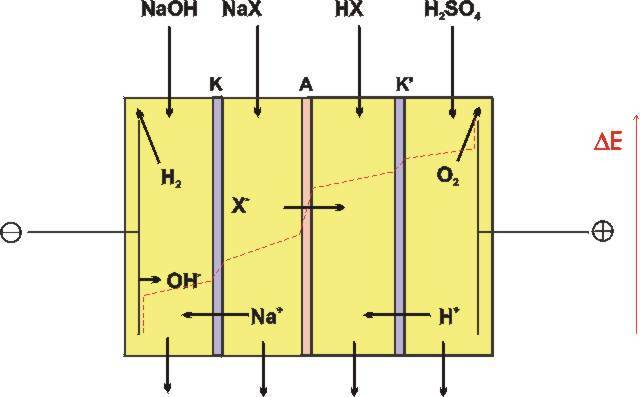 Electromembraneprocesses for the Splitting of a Salt.